Environment & Gardening for Beginners - Perelandra Ltd.
"The Perelandra garden thrives because of a new approach taught to me by nature. What I'm going to describe to you does not fit comfortably into the recognized notions of tradition, logic or even sanity. In fact, it tends to thumb its nose at all three, especially sanity. Be that as it may, it works. And that's what drives conventional gardeners a little nuts. It's also what will drive you a little nuts. Everything you know that has gone into establishing your sense of order, stability and balance, namely logic — in gardening, farming, ranching, landscaping, forestry, lawn management, pond management and in every other area of your life — will be challenged. For you see, even though The Perelandra Garden Workbook is presented through the prism of the Perelandra garden, this gardening is a metaphor for the whole of life. As you change how you approach your garden, you will, in turn, change the very fabric of how you approach everything else in your life." 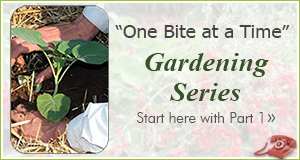 Read The Perelandra Garden Workbook! You can start with the book excerpt by clicking on the box to the right. The excerpt includes the Table of Contents, Machaelle's introduction to the Workbook, "What Is Nature Intelligence?" and a peek at the new-and-improved Perelandra Gut Gardening. If you have been applying Machaelle's gardening techniques since she published the first Perelandra Garden Workbooks in 1987 and 1990, and you've been working with nature intelligence in your garden, soil-less gardens and life — you are about to take your partnership with nature to a whole new level. Get ready for the ride of your life! And if you're new to Perelandra and haven't yet delved into any of Machaelle's books, you're in luck. The Perelandra Garden Workbook is where we now recommend all folks new to Perelandra begin their adventure. It lays a clear foundation of what a co-creative partnership with nature is all about. And it provides a perfect classroom for establishing that partnership for yourself. It includes the foundation of understanding for all of the Perelandra material, plus all the processes, steps and supporting information for working with any outdoor or indoor environment (garden, lawn, woods, ponds, farms, houseplants, terrariums, aquariums, atriums . . . ). A set of five liquid solutions that were developed at Perelandra. They contain electric patterns to be used in any environment for repairing damage experienced by soil, plants, water, atmosphere and/or animals. Each co-creative gardener puts together his or her gardening kit to have on hand to use with nature when needed. These are all important and helpful items for your kit. When doing the "Troubleshooting 2.1" processes explained in The Perelandra Garden Workbook, you'll need to have additional soil balancing options. Machaelle's tour of the Perelandra garden. Includes the garden history and development, the Workbook processes and a demonstration of kinesiology (the testing tool). A visual companion to The Workbook. Use Essence of Perelandra anytime and anywhere you wish to provide a unique foundation of balance, stability, strength and support. General balancing and strengthening for plants. General balancing and strengthening for soil.